“Hi Elspeth – That is a wonderful newsletter. I know just how important the quilts are. When we gave them to the children in our Seasons Group (a group that supports children who have experienced loss) – they absolutely loved them. They immediately wrapped themselves in the quilts and the children I am still in touch with tell me they take their quilts to bed with them at night and one little boy talks to his quilt and tells it all his worries. I also gave a quilt to a mum who lost her 12-year-old daughter to suicide – she finds that by wrapping herself in the quilt and sitting in her daughter’s room it gives her great comfort. As the lady doctor stated – Never underestimate the importance of what you do. 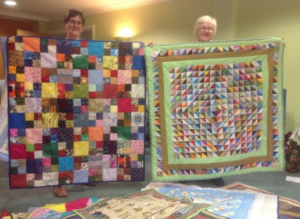 This is a photo of some of the quilts made by the Hambleton Quilters group. Shirley Dudeney from St Martins Church, Chipping Ongar, Essex coordinated and donated the delivery of knitted blankets which started off as a Lent Project but others in the town joined in and Jill Bowtle was kind enough to display some of the blankets in her shop window (Ongar Wools). Also residents at Frank Breton House and Weighbridge Court were encouraged to use their traditional skills to knit further blankets. 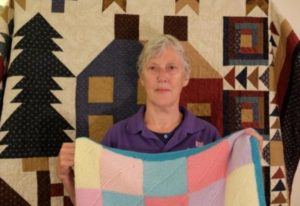 Jane Nairn, who runs St Peter’s Sewing group in Roydon, Essex have made a number of knitted blankets for Project Linus particularly for new- born babies. Some of the group’s knitters are very keen to use their well-honed skills to create knitted garments for the tiny babies and these and the blankets have been donated to the neo-natal unit of St Mary’s Hospital in Paddington, London. The items have to be washed at 600 so the ward is very grateful to receive a continuing supply as the items do not last too long at the required washing temperature. 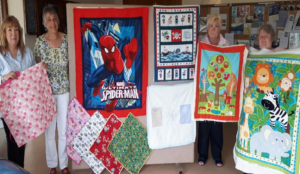 The sewing Group have some terrific knitters who also knit for Operation Christmas Child and make and donate a quilt to raffle for their Flower Festival. Reenie Dalton interpreted the 2017 challenge in such an innovative way and here is a photo of Reenie and her lovely quilt which was taken to the Festival of Quilts in August 2017. Roding Quilters have been very busy making quilts from shirt fabric generously donated by Charles Tyrwhitt, the well-known men’s tailor in London. The stripes, spots and checks are perfect for children’s quilts and the cotton fabric is superb to work with. We are very grateful to the company for their continuing support of Project Linus. Thanks must also go to Janet Howells, FredaPrice, Val Ayris and Maureen Levene to name but a few of the small army of regulars who consistently support Project Linus. They do a brilliant job using their skills for the benefit of all of the children who receive their donations. I thought that you might be interested in this small group of children. Throughout the year the sewing group of Primary 6 and 7 of Masterton Primary School sew quilts for Project Linus. They have two old Singer sewing machines which they love using to put the blocks together. 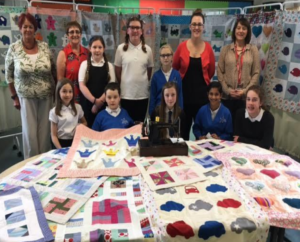 Fiona Campbell has organised this group for a few years within the school and is helped by other members of staff helping the children to produce the wonderful quilts for the children who are less fortunate than themselves. Craftwork is sold at the school fairs to fund the purchase of the fabric and some ladies from a local group the Dunfermline Quilters donate pieces of fabric to help the production line. This year I collected 15 beautiful quilts and was able to hand them over to a representative for Barnardo’s. I have a wonderful group of quilting ladies who always come up trumps when I suggest a Linus Day. I was lucky enough to spend 2 months in New Zealand at the beginning of the year and I thought I would have to plunge straight back into sewing quilts when I got back – but my ladies came up trumps again. I received so many quilts – more than 35 – that I was able to have a bit of breathing space to get myself sorted out. When I suggested a Linus Day in June I was able to offer to make it a little different, because I had bought enough fabric to fill a suitcase while in NZ – so we had a Kiwi Linus Day, just using my NZ fabric. Here are some of the results. Thank you to all my lovely ladies. Had a very nice phone call from the boy’s grandfather, a clergyman, obviously very grateful and appreciative of all the work done by Linus. They had quite a long chat and it transpired that although he was taken ill very suddenly, his prognosis seems to be very good. It was lovely to see Lyn at the Festival of Quilts in Birmingham when she spent the day there. She was able to catch up with both Coordinators and Quilters Guild members and we were all pleased to see how relaxed and well she was. Lyn will be standing down as a Director and President of Project Linus UK later this year. So…. Heather and Helen will be continuing as Directors of Project Linus UK. However, to guarantee that Project Linus UK continues to flourish in the future we need to appoint at least one more – and preferably two more Directors. It is not essential that both new Directors are PLUK Coordinators – although we would prefer one to be – as long as they have an interest in the organisation. Directors do need to be prepared to help us with some paperwork but the more it can be shared out, the less each person needs to do. We will not be appointing a new President as now that we are a Community Interest Company the Directors are responsible for running the Company. Please contact Helen Scales or Heather Russell is you would like more information about becoming a Director. Project Linus was started in the UK by Anne Salisbury-Jones in the year 2000 and I first learnt about it at the first Festival of Quilts in 2003. As part of publicising the Festival of Quilts articles were placed in a variety of magazines, general women’s as well as stitching, with patterns given for 61⁄2“ blocks. Linus had a large stand at the show with lots of people sewing the blocks together – I heard quite a bit of muttering about different interpretations of 61⁄2 “! I just wanted to leap in and help, although I doubted my quilting ability, but did resolve to find out what was required and see what I could do. I made some scrap quilts and took them to my nearest coordinator in Nottinghamshire, where I was living at the time. By 2005/6, she had retired and I had become coordinator for Nottinghamshire and Derbyshire as I lived on the border and went to quilt groups in both counties. During this time Irene Heathcote took over from Anne Salisbury-Jones to become the second President of Project Linus UK. In 2007, I offered to help Ann Fordham, the third President, at the Festival of Quilts as I still remembered the excitement of that first show. Ann told me that, because of changing family circumstances she was retiring and asked me if I would take over. I became the fourth President of Project Linus UK in 2007. In those days, it was a fairly simple job. We were still building up the network and spent most of our time telling people about Linus. A simple website had been set up on which we published information about our activities, the list of coordinators and some suggested patterns. I kept a count of quilts / blankets delivered, sent out occasional newsletters, and organised the stand at FoQ. We didn’t ‘do money’, but we did get a lot of interest and a lot of people with ideas. now having a family, she is still doing the technical work for us. We kept the format at FoQ the same for several years with a block challenge and information for potential volunteer quilt makers and coordinators. At the same time, we did more shows. Elspeth Russell, our Scottish Regional Coordinator, was busy in Scotland. I went to Uttoxeter and several other people did the shows in their areas. One big event we got involved with was at the V&A which wanted the Quilters Guild to provide hands on experience for their visitors alongside an exhibition of quilts that they were collating. I worked with Jane Steward of the Guild to design simple blocks that we could instruct people how to make and then put together to create a top. The V&A provided the fabric and fleece backing. These were then donated as Linus quilts. The V&A invited lots of Girl Guides to come along for a day to hear about Linus quilts and to make a block. We had nowhere to work except sitting on the floor in one of the galleries! It was clear that many of the girls had never been taught to sew – but they did think my thimble was cool. This idea was later used at the Knitting and Stitching show at Olympia where Jane and I designed another block. Guild member volunteers cut packs and helped visitors to make blocks and lay them out on a design board to show the different effects that could be achieved as we turned them into Linus quilts. I went down to help for several years before handing it over. Meanwhile we were recruiting more volunteer coordinators who were giving out quilts and blankets – over 317,000 items so far with some coordinators having achieved huge totals of 10,000 to 15,000. Coordinators were also finding new ways of raising funds and getting donations towards purchasing fabric and wadding by asking local companies or councils for support, organising sales of work or raffles etc. In some cases, generous organisations have provided quite significant amounts (well, significant by our modest standards). I couldn’t believe Heather Russell when she started selling 50p scrap bags but they sell amazingly well at shows. About five years ago I realised that we had £10,000 a year going through the Project Linus UK account which was set up with just my signature and I started thinking about what would happen if I went under a bus, or if someone started asking questions about whether the money was properly accounted for. I made several attempts to set up the sort of ‘club’ structure that I was familiar with where there was a committee to take responsibility for decisions, but with everyone spread across the country this was a non-starter. Helen Scales (a Midlands Coordinator and also a Quilters Guild member) who had assisted me at the FoQ was persuaded to become a second signatory and she suggested I ask Heather Russell (another Midlands coordinator) who had lots of good ideas and suggestions, to help us. We talked to a local solicitor who suggested that we form a Community Interest Company (CIC). Project Linus UK CIC was registered with Companies House in February 2013. Helen, Heather and I were registered as Directors. At the 2016 Guild AGM I met Jackie Anderson, a retired book-keeper, who agreed to become the Project Linus UK CIC Treasurer. So, we had everything more or less sorted out. And just as well we did, because I got carried away with the exercise machines at the gym (well, I still felt as though I was only 40) and had a stroke at the end of December 2016. For a while I could barely speak or move. Thanks to Heather, Helen and Jackie they have been able to keep the show on the road and they have plainly got lots of ideas of how to move us forward. This effectively put an end to my Presidency, but not my involvement with Linus as I will still be making quilts with the machine donated to PLUK by APQS. We are looking for one, or preferably two, people to join the Directors of Project Linus CIC to share the work and I am sure they would find it is rewarding as I have done.